North Central resident Annie Dunn still feels frustration as she recalls the night two months ago when her friendly Goldendoodle, Raleigh, was attacked by another dog that was being walked by its owner off leash. Annie and Bruce Dunn and their Goldendoodle, Raleigh, stop by the alley where Raleigh was attacked by a dog whose owner was walking it off leash on the night of Dec. 1. Raleigh received stitches in her legs as a result, but is otherwise OK (photo by Teri Carnicelli). It was late, past 10:30 p.m. on a Saturday night. Annie, who works part time as a singer in a local band hirable for private events, and her husband Bruce were walking Raleigh when they passed an alley near 12th Street and Butler Avenue. That’s when they saw the dog approaching. The owner of the dog came up just as Bruce picked up the other animal by a back leg to get him away from Raleigh. The owner said a quick “sorry,” took his dog—now on a leash—and left. Raleigh wound up with stitches on three of her legs, but fortunately doesn’t show any signs of anxiety, even when walking past that same alley. The Dunns, who have lived in the neighborhood since 2012, called the Phoenix police to report the incident, but were told to call the Maricopa County Animal Care and Control hotline instead. But, because they didn’t know the name of the owner or where the dog lived, there was nothing MCACC could do. “We weren’t going to chase the guy down because we didn’t want to risk our own safety,” Annie pointed out. Which means that the unknown owner won’t face any responsibility—and his dog might one day attack again. Annie posted to her neighborhood Nextdoor.com, site, sharing her story and a description of the dog: about 40 pounds, shorthaired, tan, slender, and with an orange glow stick around its neck like a collar. 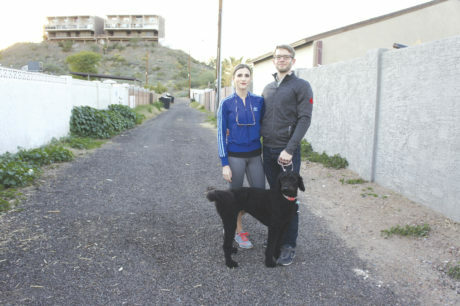 While none of those who responded could identify the dog or its owner, many shared similar stories of walking in their neighborhood, or at city parks, in the mountain preserve, or along the Arizona Canal, and being confronted by off-leash dogs and their unconcerned owners. Some commented that when they asked the dog’s owner to put the animal on a leash, as is required by law, oftentimes the dog owner would get belligerent or defensive. They questioned what resources, if any, are available to combat the issue. Local resident Connie Kadansky, a dog owner herself, was following the posts and decided to organize a community meeting with officials from MCACC, city representatives, SRP, and the Phoenix Parks Department. That meeting was held on Jan. 17 at North Mountain Brewing. Lt. Chris Kunszt of MCACC said his agency is complaint-driven, and needs citizen involvement. He pointed out that animal control has a total of 23 officers to serve all 9,200 square miles of Maricopa County, and there are only 6 officers on any given shift. The laws in Maricopa County and all of MCACC’s contracted jurisdictions—including Phoenix—require all dogs to be on a leash no greater than 6 feet in length when not on the owner’s property, and confined by a fence suitable to contain the dog when at home. If you can safely identify the owner and his/her address, you can call to report the violation at 602-506-7387 from 8 a.m. to 5 p.m. seven days a week, or you can fill out a report online at www.maricopa.gov/249/Report-an-Incident. At some point an animal control officer will visit the home and provide the offending dog owner with a warning, and resources related to dog laws. The officer will also check to see if the dog is licensed and up to date on its rabies vaccinations. If not, the owner and the dog will be given ID numbers to attach to the report, and the owner will be given a grace period to have the dog licensed and vaccinated. The crucial thing, Kunszt says, is there will now be an official report on the dog and its owner, so that if other reports of similar issues—negligence on the part of the owner walking the dog off leash, or aggressive behavior on the part of the animal—come in to the agency, then a history can be established, which gives MCACC more authority to address the issue via citations or other means. If a human gets bit, the offending dog has to be quarantined for 10 days while it is evaluated for rabies or other health conditions. If a dog bites another dog, it is a civil offense, since dogs in this state are considered property. A dog biting a human is a misdemeanor criminal offense, and the dog’s owner has to be in court within 10 days. However, this type of case is considered hard to prosecute, unless there is an independent, third-party witness willing to come to court to testify. If you don’t know the owner or where he or she lives, but you see that person and dog consistently in the same area, around the same time of day/night, you can report that as well and ask for an officer to patrol the area when available. What if the offense occurs somewhere a patrol car can’t go, like in a city park, or a mountain trail, or along the SRP canal? That’s where inter-agency partnerships become crucial, said Al Aguinaga, director of Operations, MCACC. “We know there are issues along the canal paths,” he said. “This isn’t a new problem. We were out here a few years ago as well,” after a fatal stray dog attack of an owned dog in 2016. Aguinaga suggested employing temporary signage that MCACC can put in place quickly, alerting canal dog walkers that the area is “under watch” for leash violations. The agency would just need to get permission from the canal’s owner, SRP, first. Chad Barnes, an SRP water master who was at the meeting, said that wouldn’t be a problem, and canal workers, who are regularly doing maintenance and other work along the canal, could also be asked to keep and eye out for off-leash dog walkers and perhaps hand them educational information about the leash law. Barnes added that SRP could work with MCACC on the possibility of adding more permanent signs, if needed. She broached the idea of asking the Desert Horizon Police Precinct’s Bike Squad, which often patrols the Sunnyslope area, to be on the lookout for owners walking their dogs off leash and to stop and inform them of the leash law and perhaps hand them a flier with more information. Similarly, the Phoenix Neighborhood Patrol (PNP) volunteers could do the same, though unlike the Bike Patrol officers, they have no authority to actually write a citation if warranted. Stark noted that animal control officers like Kunszt are willing to come speak at neighborhood association and block watch meetings to help address the issues in those areas. She suggested an e-mail could be sent to all neighborhood groups listed with the city with information about how to invite an animal control office to come speak to their groups.